A gyroscope is an instrument consisting of a frame supporting a disk or wheel that spins rapidly about an axis. Technically, a gyroscope is any body that spins on a movable axis, including a child's toy top and the planet Earth. A gyroscope maintains a fixed axis of spin in spite of forces of gravity and magnetic fields. French physicist Jean Bernard Léon Foucault (1819–1868) invented the gyroscope in 1852. Foucault mounted a heavy wheel onto a shaft and spun it rapidly. When he then turned the shaft with his hands, the wheel resisted shifting from the plane in which it was spinning. 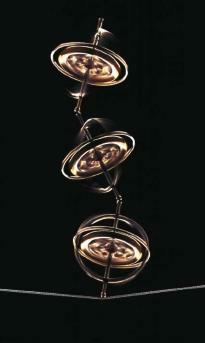 The gyroscope follows one of the basic laws of physics, rotational inertia. This law simply states that a body that is set spinning has a tendency to keep spinning. Foucault's gyroscope demonstrated the rotation of Earth. The spinning wheel, which was not stationary, retained its alignment in space while Earth turned under it. Foucault also found that the force of Earth's rotation caused the gyroscope's axis to move gradually until it was aligned parallel to Earth's axis in a north-south direction. Unlike traditional magnetic compasses, the gyroscope can indicate true, or geographic, north rather than magnetic north, which varies depending on the location of the compass. Once a gyroscope is set spinning, no amount of tilting or turning will affect the gyroscope. This stability has allowed the gyroscope to replace the magnetic compass on ships and in airplanes. I have seen a colour photograph of a single gyroscope on your site before and wish to use it in a book chapter to help explain the process of praxis evaluation. Would you kindly let me know how to obtain permission for this please, and to recieve from you a high quality jif file of the image? hours, working, prescession, gyroscopic effect, etc., produce elctricity too, is an electric generator and ligth two leds.